Benedict Ryan continues to encourage Jace to take action with the Purifiers. Marcos asks Clarice to go to the Morlocks in search of information on the Inner Circle, and Thunderbird gets a call from Evangeline. 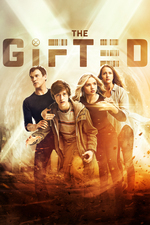 Den of Geek review - The Gifted stumbles setting up the board for the end of the season. I liked that they alluded to the bonkers comic book storyline of Andrea's dead skin being grafted to a sword, so Andreas could use their powers after her death. I'm not sure I like the plot point, so much as a vague sense of admiration that someone thought up such a ridiculous Fenris workaround, and got it up the chain and into print. So the fact that it's an easter egg and not an explicit thing is almost better. I was mostly just only paying attention to Marco and Lorna reuniting, I was happy about that one. Less happy about evil Lauren. I did not notice that sword thing because I kept zoning out but ewwwwwwwwwwwwww I'm glad I missed it. I second what the Den of Geek article said about Jace. I feel sorry for the actor being stuck with this part and where it goes. I don't care about his ex anyway but this was out of the blue and weird and I wondered if there is some mutant who can imitate anyone's voice that was screwing with him. That kid calling him out about the Klan was gold. It was super subtle. He mentions his sister is dead, and instead of having his powers flow through his hands, it flows through the sword. Fenris has always been shown holding hands to activate their powers. But I can’t remember if they’ve been explicit about that point. Lauren and Andy are stronger together, but have abilities on their own. So they can pretend Andreas’s powers work differently without Andrea without explicitly using the comic book explanation. uhh they only showed him pulling out the sword, nothing about skin grafting. I thought this was a really strong episode, with character moments like Marcos breaking down with Lorna and her coming back and actually apologizing. Lauren turning evil was a surprise, but interesting enough. I'm wondering if it's the music box affecting her subconsciously somehow with Fenris' powers reaching out from the past, or just a natural evolution of her worldview with everything going on. Maybe both Andy and Lauren have always meant to be going down this road, just Andy got there quicker. I couldn't disagree more with Den of Geek about Jace, and I don't think Cody Bell would want sympathy from us. The Purifiers as the Klan scene was a really strong one and he knows how great it came across. Any actor worth their salt would want an opportunity to portray such a complicated character. He's always been the voice of reason for the Purifiers, but the Klan moment definitely stunned him into silence until the gunshot went off. I can see the progression of how he was turned extreme by people like Benedict Ryan, and then seemingly being lied to by John in the last episode, to who he realizes he has become, a member of a hate group. Then having to hold on to some semblance of loyalty he defended Wilson to the cops, and is then wracked with guilt about supporting the straight up murder of an innocent teenager. And yes, his wife calling because of the Ryan Hour was a little out of character, but I can see that perhaps she wants to believe the best in him, that what he's been telling her and made her kick him out was actually true, that mutants are indeed dangerous. So she feels "proud" enough to maybe take him back, but he knows her entire reason are just complete lies by Ryan. He might really want her back, but he's not willing to compromise himself and his true morals, even though he already made the wrong choices, and that is something that Cody Bell really got across to me. If you ever watched Burn Notice, you can see the gap in acting abilities for him between that show and this, and it's because of how much better written this show is. I think Jace is a great foil for the mutants, a human who just believes in just doing the right thing but is operating with biased experience about mutants. That's much more interesting that just setting this show up to be about just mutants against mutants, or against some conspiracy. I think the end point will have him siding with the underground, but how they'll get there will make for good television.